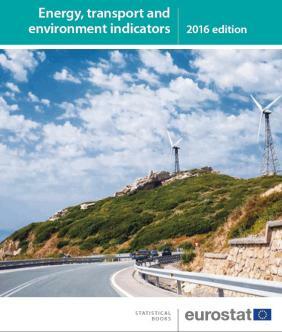 (10 November 2016) – Eurostat today publishes the 2016 edition of the Energy, Transport and Environment Indicators Statistical Book. The publication opens with a general data chapter which offers a first macroscopic overview of the main characteristics of the EU and its position with regard to the main economies worldwide. In the Energy chapter, indicators presented include supply, final consumption, renewable sources, energy dependency, energy efficiency, and energy prices. Transport indicators cover infrastructure, equipment, freight and passenger transport, accidents and transport-related emissions for the different modes of transport. Finally, the Environment chapter includes indicators on climate change and greenhouse gas emissions, waste generation and treatment, water resources, abstraction and use, wastewater treatment, forestry and biodiversity, chemicals, material flow accounts and economic indicators on environmental protection expenditure, the environmental goods and services sector and environmental taxes.